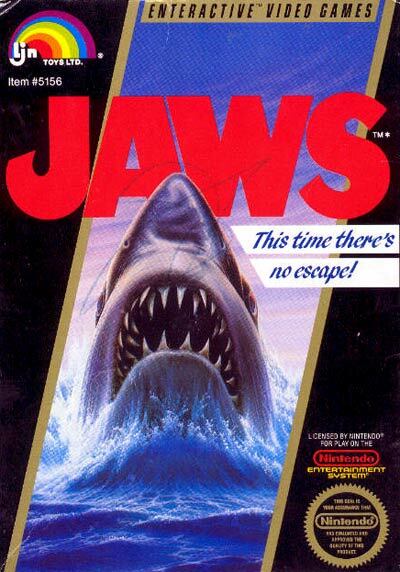 Jaws is an NES game based on the film franchise of the same name, specifically Jaws: The Revenge, the fourth and final film in the series. Unlike the movies, the game is a simple shark hunt arranged like an action RPG; the player pilots a boat across the sea, randomly encountering groups of hostile sea creatures. The goal is to avoid the titular shark while gathering conch shells to purchase improved gear. After gaining enough conch shells, the player can increase the power of their armaments. The player can also find a submarine which appears at random places in the game map. The submarine allows for greater mobilty and firing power. Upon reaching a high enough level, the player is able to confront jaws and take away all of his health using spears and/or bombs. Once he is defeated underwater, the game changes to a "first person" mode of your ship. You then have three chances to activate the strobes, thereby launching him out of the water, at the precise time and distance from the bow. If you successfully stab him with your front mast, he sinks into the depths of the sea, never again to be seen by the world of man.